Listen Up! 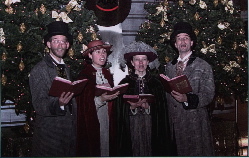 began in 1994 because a few people wanted to use their singing abilities to share their faith. Rob Sjouke talked with Scott Raab about the possibility of forming a quartet to sing a capella music with a message. Rob's wife, Iris, could sing the soprano and a high tenor, and Rob and Scott could both go various different directions. But they needed a fourth voice. Reuben Rog, who was a student at Eindhoven, but living with Scott at the time, added an enthousiastic bass to the mix. In the first year, the quartet try to do as much as possible although there was quite a distance separating them. Rob and Iris Sjouke live in Haarlem and the other two men lived in Maastricht. Still, with just a few rehearsals before their first performance they were able to find a characteristic sound and harmony. Unfortunately, this was not to last very long, for Reuben finished his training and left to study further in the United States. 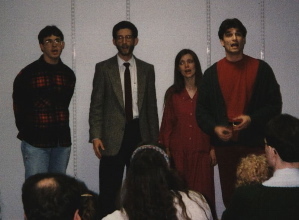 In the meantime, while Scott had sung the alto, the group had been able to sing a time or two with Veronique Hofman. When Reuben had to leave, the choice was made pretty quickly to add "Vero" to the mix. The sound evolved a bit, and the whole mix stayed balanced and harmonious. Listen Up! has sung with this group since 1996. Despite the distance separating the members (Vero lives in Eindhoven) the programs became longer. For a short six months in 1999 Listen Up! was a five-man group. Luk Brazle was added to the group that year. Scott sang alto with Veronique, bass with Luk, or tenor with Rob. This made it possible to sing some fuller songs. Afterwards, Luk also returned to the United States to finish his studies. In August 2003, after having finished his studies and married his wife, Holly, Luk returned to Belgium. Listen Up! asked him to join them once again. Since then Luk's deep bass and wonderful lead voice have become part of the unique sound of Listen Up! When Listen Up! first began, it was with about five songs at an activity organized by one of the churches in the Netherlands or Belgium. The purpose has always been to touch people with the unbelievably good news of Jesus Christ. Soon it became possible to present a longer and more varied program. Currently, Listen Up! has a program varying from a few songs to an evening filled with song, according to the situation or needs. Technology has also developed along with the group. Listen Up! 's motto "We think words are pretty important" is not just a motto. Because the message has always been the most important part of the song for Listen Up!, the words have always been shown. By the first performances, this was with printed words on cardboard. Very quickly this was changed to overhead sheets. Currently the group uses a projector to beam a computer designed powerpoint presentatie to the listeners. Using the technology available has helped get the message out. Listen Up! continues to search for ways to bring the message of God's love in an exciting and challenging way. This can be for a small group in a community center for a birthday party or an auditorium full of people gathered for the opening of a center for the homeless. From the beginning Listen Up! has also wanted to help churches learn new songs and learn to enjoy singing for God. Along these lines, the group thought of making a cd or interactive cd with songs in four parts. In this way, a church could build its own repertoire. Another possibility was a "song camp", the possibility to get together for a weekend to learn to sing better - not only tuning the voices, but tuning the hearts for God. In the 2003 Listen Up! became a foundation in order to better serve these needs. 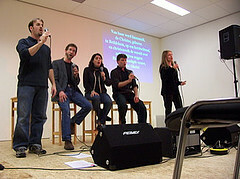 The first "Song Seminar" was held in The Hague in the summer of 2002. A first cd with songs for the churches was presented in March 2004. The group has brought out two cd's with their own songs (see music to hear parts of the songs or to order the cd's). After having sung in Austria, Croatia, the Czech Republic, Germany, France, Switzerland, the Netherlands and Belgium, Listen Up! now dream of a mission trip to Suriname.